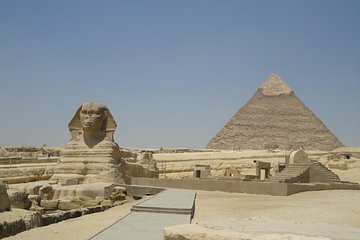 This half-day morning Giza Pyramids and Sphinx Adventure from Cairo offers travelers the chance to experience the best of this ancient city. Early morning departure insures you’ll beat the crowds as you make your way to the Giza necropolis to admire the giant Sphinx and three great pyramids. Your expert local guide will share stories and history about their construction before taking you to a local restaurant for an authentic Egyptian lunch. Join your guide in the early morning hours at a Cairo meting point and make your way to the Giza necropolis on this half-day tour. Prepare to see the iconic Sphinx and three pyramids, including Menkaure, Khafre and Cheops. Your local guide will transport you through the gate at the Sphinx, where you’ll avoid crowds and gain incredible access to the human-headed lion statue—one of Egypt’s most famous images. Listen in as your guide shares stories and history around this strange structure’s creation as you marvel at its size. Then follow your guide to the pyramids of Giza, which were built around 2550 BC. Learn how these massive tombs were designed to protect pharaohs as they made their way into the afterlife. Get an up close look at Giza’s largest pyramid, Cheops, which stands 481-feet (147 meters) tall. It is recognized as one of the last Seven Ancient Wonders of the World. Next your guide will take you to Khafre and Menkaure—two other well-known pyramids. Enkaure is named for the fifth king of the Old Kingdom and was built with granite, rather than limestone, which is more typical of other pyramids. Once you’ve had your fill on the ground, journey to a popular viewpoint where you’ll get a bird’s eye view of these spectacular structures against the modern Cairo skyline. Take free time to enter one of the pyramids (own expense) on your own, before driving into the city for an authentic meal. Enjoy typical fare like koshari (lentil, fried onion and chili sauce) or falafel before heading back to your starting point with full bellies and a deeper understanding of one of the ancient world’s most impressive wonders. Of all the tours, this is the one we enjoyed the most. Good bus company, very accommodating driver and most of all spending another day with Hend put this tour on the top. We not only have a tour guide, but we also have a photographer, she gave us ideas on what to expect, how to handle persistent vendors and most of all we gained another friend. Hend is just not knowledgeable about the history, but she also knows how to conduct friendly conversation. If she doesn't know the answer she has no problem of saying I don't know and researches the answer. She always got our backs.